olic Church in West Palm Beach. 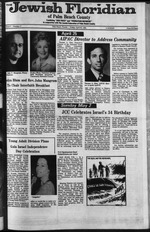 sion to Israel in November 1981.
span a wide variety of interests. remainder of the Sinai to Egypt. tor, to speak April 25. Affairs to Senator Frank Church. f>rt in Palm Beach Gardens. N in our Jewish community. one mile west of the turnpike). The program, chaired by Dr.
ety of Women Journalists, Dr.
1:30 pm for teens and adults. imp in between scheduled events. bration of Israel's 34 birthday,"
rael this summer, announced Dr.
U.S.Y. in Israel this summer. Palm Beach Gardens high school. secretary to the Class Council. has been vice president of U.S.Y. zer. members of Temple Beth El. the odor of grease paint. life once the curtain falls. gang of Arabs ambushes the star. and Israeli motif Seder plates. direction of Rabbi Alan R.! in spite of this pressure. want to be publicly associated. Bonn and a top aide of ? which met in April in Orlando. Project of the Jewish Federation. have no intention of leaving. come to Yamit over the holiday. meeting of the board, and will be presented on June 6,1982. Arabs were killed and wounded. Of Israel Will Rally in D.C.
United Nations. In June. 1968.
was made in the Senate by Sen.
one of the founders of which. served from 1939 to 1962.
he considers himself to be Jewish. free of both gift and estate taxes. exceed the 37% dted in the example. on Thursday, Apr. 29 at noon. Thursday. Apr. 29 at 11:16 a.m.
at the American Savings Bank. that this chain is not brofa. Our program. Media to Sinai. served. Call for car pools. is one of the oldest Sabbath traditions. is one of the most delicious. doah," at $28 per person. Roth re World's Fair Trip. 110 Southern Blvd., Palm Beach. rising program due to illness. On Tuesday, Apr. 27 at 10 a.m.
who reside in Century Village. percent corn oil so it's low in saturated fat with no cholesterol. tuu iuraii :wex namac -Mnnat. imig n: ait Nacama. Hiinn i i aac Spars Jtmnmiflmziar f space iin; cnaceK. aaaaatu rum-ecu sm:ia at ait nww^l- aorta. aaa aaai Saaa Dakar no* at ync da it? bbboquk ZTiur at Apex 15. Joan! i to reach their destination. to the capital fund of the Jewish Community Center. Mrs.
r is shown on the left. quality and many more bargains. warehouse at 3420 West 45th St.
stereo, etc, please call 689-7700.
as a Bat Mitzvah, Friday, Apr. F*i "PPraisala are guaranteed accurate. Serving chptl thro-ehout the U.S. end Canute ,nd all Soutn Honda CemeMriet. given to as of the ten plagues. creation, af the fancy, "nor is it"
about, or perhaps we may say. could also foresee, "the coming"
of many of these plagues. "One saw not his brother!" See how truly the Bible speaks! 8 p.m. m the social hall of St.
ple Beth El Sisterhood players. Pauline Edetson at the piano. Minimum donation is S 18.00.
p.m Oaity services 8:15 am. and 6:30 p.m.
499 9229 Harry Silver. President Daily services 8 am art*.! Emeritus Or. Richard Q. Snugarrnan, President Stephen j.
tain. Administrator .Sabbath Services. Friday 8 p.m.
Rabb> Joel L Levine Cantor Rita Shore Barbara Cr**! 7778 Services Friday evenings at 8 p.m. Meeting at St.
Speiser Phone 689-9430 President. Samuel Eisenleld. a.m.. 6 p.m. Mincha followed by Shotosh Seudoa. Thursday at 8:15 a.m.. Friday at 8:15 p.m. Saturday at 9 a.m.
Rackoff Sabbath services. Friday at 8 p.m.. Saturday 10 ajn. Sabbath services. Friday at 830 p.m.
at Faith Onited Presbyterian Church, tfb Aawneida Drive. 1*01 N.W. 4th Avenue. Boca Raton 33432 Phone: asee *,! Rabbi Bernard Silver Cantor Benjamin Adter Sabbath tsn"
f"day at 8*0 p.m. Saturday at 9 am. Yugoslavia to Renew Ties to Israel? e School which wss held Wednesday. Apr. 7,1982. *as held at the Center, Wednesday, Apr. 7,1982. anese border since last July. I parents Wednesday, Apr. 7,1982. Temple Emanu-EI Sisterhood Installation of Officers 8:30 p.m.
SOVIET JEWRY TASK FORCE- 1:30 p.m.
Beach- board 12:30 p.m. Temple Beth El Executive Bd. 7:30 p.m. Temple Beth Torah Sisterhood Board 8 p.m.
ed at 140714 Lane in Lake Worth. leader and Rita Shore is cantor. lottery. Israel drew 15th place. tion to afl of us." stated Arnold J.
treasurer, and to Ann Leihovk. Born in Memphis in June. 1910.
tary of Interior to Harold I ekes. the United Nations in 1945.